The Christians in the early days used to decorate the churches with devils and demons in order to remind the presence of both evil and holy spirits. From the beginning till the present day, sculptures have been chiefly monumental. In the fifteenth century, the monuments to the biblical heroes were constructed on every street of most of the Italian cities. In the twentieth century too, a statue of a famous singer was carved in the heart of New York. Amazing fountain sculptures are still quite popular besides the contemporary skyscrapers. The Sumerians of the ancient days celebrated the military triumph with sculptures. The world war-2 participants also got the sculptures of the soldiers made to honor them. Traditional sculpture forms and paintings comprised mainly of religious and allegorical figurative artworks, which did not reflect the altering quality of the works even in this modernized and industrialized world. The modern sculptors aimed to create a solely aesthetic artwork, which referred to its own survival only as opposed to the other art objects in this industrialized period. Today, huge number of abstract forms of Artistic Solutions in Kolkata is found. 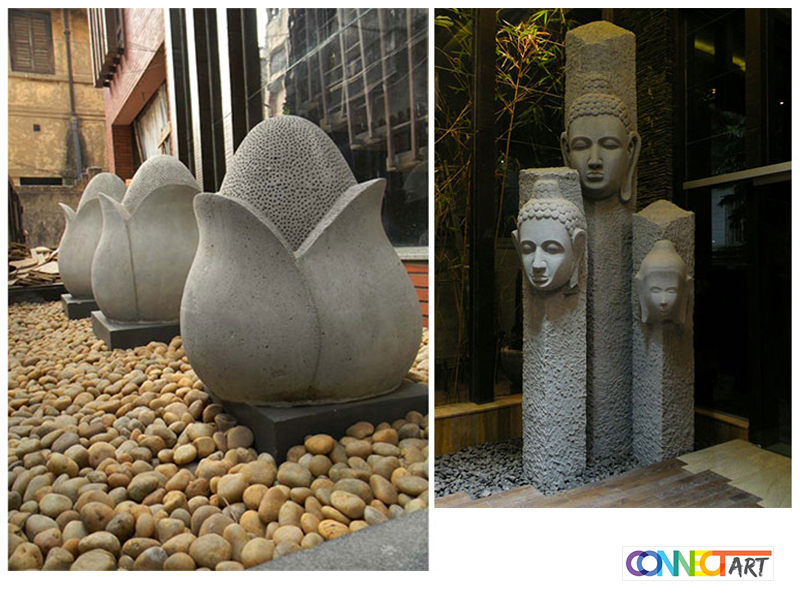 The sculptors from different corners of the city present their own take on the latest subject matters. The perfection of their work is reflected through the sculptures they make. Contemporary sculpture making tradition influences the modern artists, thus, resulting in the unfussy styles and intangible public works. Modern Sculpture Making Techniques:- Impersonator sculptors, for instance, created works that exemplified by the rough textures that is similar to the hasty mimic brushstrokes. The cubic carving established a play with several perspectives and trampled the shapes and planes. Mostly, the modern sculptures are made up of durable materials like stones, metals, wax, wood, glass, plastic, and fiber. Many modern sculptures are found in the form of bicycle wheels, high heels, coats racks, etc. Some other demanding forms of modern sculptures include geometric shapes, abstract household objects, animal forms and human figures. Besides sculptures, Connect Art Kolkata also makes stylish and handcrafted artistic furniture and graphic paintings. The talented minds and the extraordinary craftsmanship of the artists give their best to manufacture an amazing and dynamic artwork to beautify the surrounding space. These artworks can be customized too here. The customers are always welcomed to choose their preferred materials and specify particular forms and sizes to get their desired adornments.